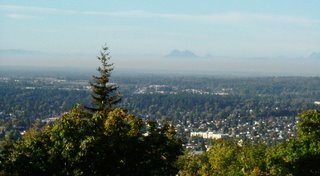 Smog from Vancouver, BC and other places like Bellingham. One doesn't normally think of smog here, but we have it too. In reality, this layer looked a bit browner than in photo. Cars, wood stoves, forest fires, you name it. An air inversion can trap the crap against our backdrop of mountains. This happens occasionally. 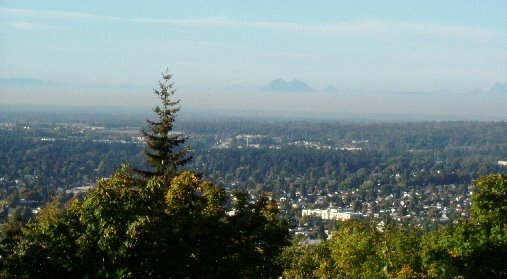 Image shows inversion layer from Sehome Hill in Bellingham. This is looking north across Fraser Valley with it's backdrop of mountains. Yikes! That doesn't look too good, Robert! Another reason we should be cycling and getting out of our cars!